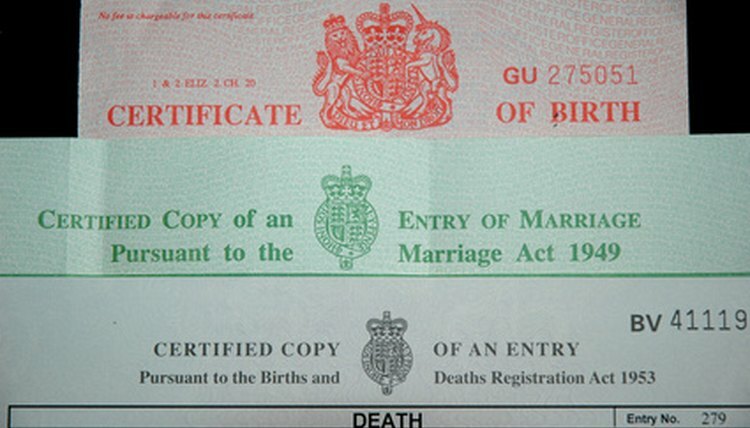 There are a number of reasons why you might need to make changes to your birth certificate. Name changes, marriage or other major life events can necessitate this sort of alteration. To make changes to your birth certificate in the state of Kentucky, you will need to contact the state's Office of Vital Statistics, although you can make some requests for your Kentucky birth certificate online. In most cases, the court will file documents regarding a name change for you, and the change will automatically be reflected in the record of birth. To assure that your name change will go through with as little back and forth as possible, you may need to obtain that court order yourself. Situations that require a court order include name and birth changes for reasons other than incorrect recording. If you are changing your name for personal reasons, either going by a new name as an adult, undergoing a surgical gender change or updating to reflect new parents after a legal adoption, you will need to obtain a court order. Submit all supporting evidence for the name change and a $10 fee for each certificate to the Kentucky Cabinet for Health and Family Services, 275 East Main St., Frankfort, KY 40621. Walk-in applications are also accepted from Monday to Friday, 8:30 a.m. to 3:30 p.m.
To add or change the name of a father on a birth certificate, you'll first need to assess why you want to make a change to the birth record in order to ascertain what form you will need. For example, in cases where the father isn't named on the certificate, but paternity is being established, you need to fill out form VS-8. Unmarried mothers can use form VS-8B to establish paternity when the birth certificate is filed, and married mothers can use form VS-8C to delete a named father or to amend the certificate with another paternal name. In cases where you need to amend clerical errors, such as misspellings or dates, within the first year of a child’s life, you can do so by phone at 502-564-4212. All changes need to be requested by a parent, legal guardian or another party that filed for the birth certificate. The Kentucky Office of Vital Statistics is the office that collects, protects and stores certificates for all births, marriages, divorces, deaths and stillbirths in the state. The purpose of the office is to record the vital records for each person who is born in Kentucky and is a means to acquire legal documents to prove identity. This office also supports the collection and analysis of vital statistics data. The quickest way to obtain a birth certificate is to order it online from the Kentucky Office of Vital Statistics. Birth certificates cost about $10 each. You can also purchase a new birth certificate by phone or fax. All orders processed will go through the VitalChek Network, Inc. VitalChek is an independent contractor and not a part of the Kentucky Office of Vital Statistics. If someone tells you that they are using a system other than VitalChek, they are not affiliated with the state of Kentucky. The phone number for VitalChek is 800-241-8322. If you cannot order a birth certificate by fax, email or phone, you can get one in person at the Office of Vital Statistics at 275 E. Main St., Frankfort, KY 40621 between the hours of 8 a.m. and 3:30 p.m. Monday through Friday. The fees remain the same regardless of how you obtain the birth certificate. Each birth certificate is a separate order, and there is no discount for multiple orders. Smyth, Danielle. "How to Change Birth Certificates in Kentucky." , https://legalbeagle.com/6296667-change-birth-certificates-kentucky.html. 13 February 2019.